Papier Plume Lake Michigan Summer is one of the two inks Papier Plume made for the 2017 Chicago Pen Show. (The other ink they made is Ivy 108.) While they are both sold out now, I still think reviews are helpful because they can show you what the ink is like, and what inks you could use that would be similar. You can find some information about this ink here on Papier Plume's blog. 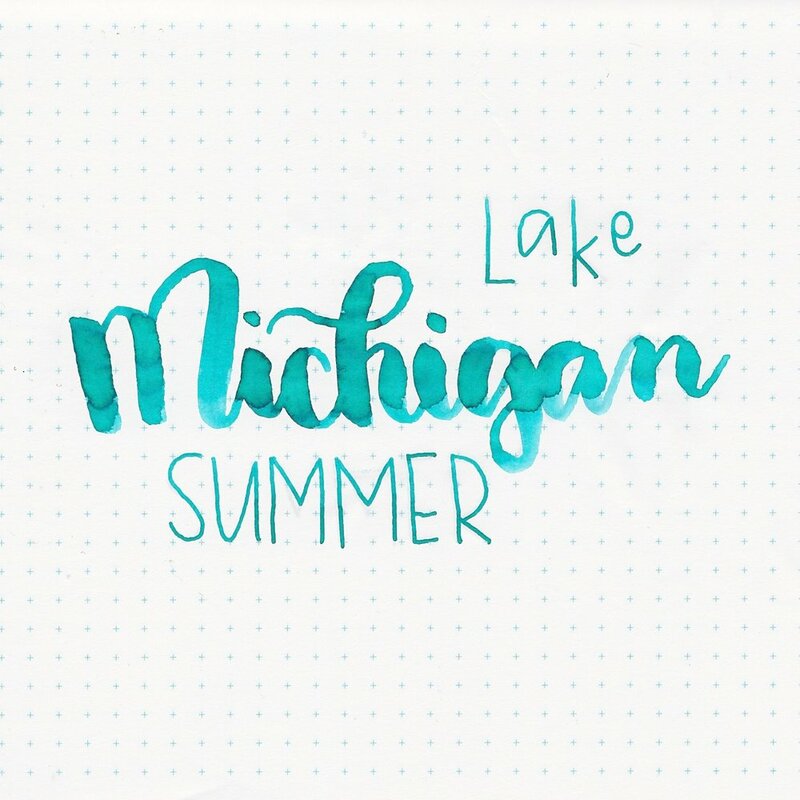 I purchased my bottle of Lake Michigan Summer from Papier Plume's website. The bottle is glass with a metal cap. The top of each bottle is stamped with a wax seal Fleur De Lis. Lake Michigan Summer is a medium Teal with some shading. Ink drops show the tiny bit of pink sheen this ink has. Feathering: Lake Michigan Summer has medium feathering on Baron Fig paper, but had no feathering on the other papers. Bleeding: Lake Michigan Summer only bled on Baron Fig paper. Ghosting (show-through): Lake Michigan Summer has low to medium ghosting on all of the papers. Shading: Lake Michigan Summer had very low shading on all of the papers. Only the ink drops on Tomoe River paper showed the tiny hint of pink sheen. Inks for comparison, left to right: Papier Plume Lake Michigan Summer, Diamine Steel Blue, and Diamine Marine. Left to right: Kaweco Paradise Blue, Nagasawa Kobe #48 Water Source Marche, and Robert Oster Tranquility. Kaweco Paradise Blue is the closest ink to Lake Michigan Summer. Using a Noodler's Ahab flex nib on Tomoe River paper showed a decent amount of shading, but this ink has an average flow, and showed quite a few hard starts with the nib. Overall, Lake Michigan Summer had an average flow, and light shading. Seasonally, I would use this ink in the summer.